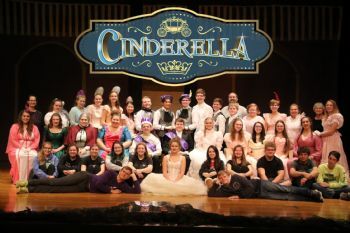 Well, Cinderella is done! It was another amazing night. I am grateful that I was able to help out this year. It helps that the students just love me . Now moving on to the Winter concerts. I actually have the next two weeks off except for playing for the Veteran's Day program at the Middle School on Monday. That will be nice. Overall it was a pretty good day. I attempted to sleep in, but since I was on the couch again that proved futile. I really hope that my cough tonight will subside enough for me to sleep better. The extent of my day was resting and doing laundry. The boys were aggravating today. We had a few issues, but luckily things settled down a little bit. I just didn't really have the energy to deal with it and unfortunately lost my temper way too much. Tomorrow is a new day. 1. Nutrition: better, but snacking was still off. 3. Personal: Read my Bible and devotional. Finished the Sudoku out of last Sunday's paper. Finished a magazine and started another. Will have prayer/journal time when I am done here. Tomorrow - church, football and praise team practice with resting in there too. The boys have Scout stuff to do off and on all day, so they'll be busy too. It's nice to have a break between events. Enjoy your Sunday and the peaceful time. Congrats on a lighter schedule for a couple of weeks. Now maybe you can help out the cold recovery with needed rest.